The much awaited movie Sarabjit, starring Randeep Hooda, Aishwarya Rai Bachchan, and Richa Chaddha in lead roles was released on Friday. Bahu Bachchan wore a Monisha Jaisingh Anarkali for a pre-release promotion. As always, she did justice to the outfit. Let’s take a look at Ash’s outfit! The film is about a wrongfully accused man, Sarabjit played by Randeep Hooda and spends over 20 years in a Pakistani jail. Aishwarya plays the role of his sister, Dalbir Singh, who fought for setting him free. She has been commended for her work in this film. Even though she played the role of a commoner, she made up for the style quotient during her appearances for the film’s promotion. 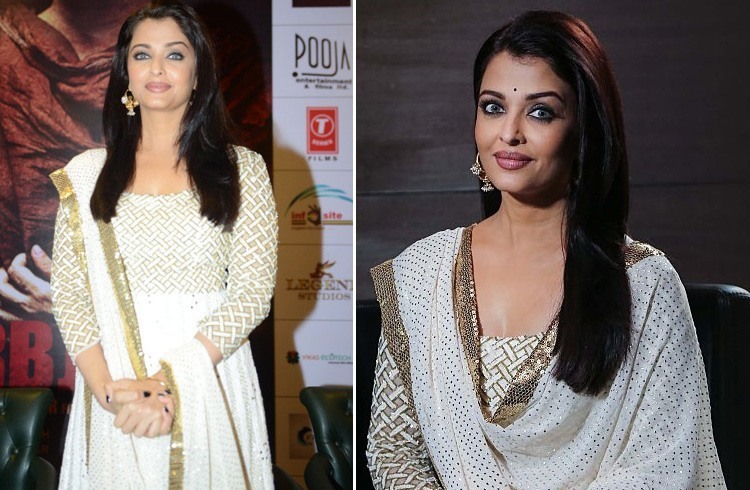 Aishwarya redefined simplicity and elegance in the gold and creme Anarkali. She is wearing a pair of balis from Amrapali and her golden Jimmy Choo heels completed her look, stylish as always.